A particular pet peeve of mine is triggered when I hear Christians make the assertion that God’s blessing is reserved for America. While the average Christian today could not give a logical defense of theology, they are adamant about how God is on America’s side. The problem with this argument is that it does not come from any authoritative passage from Scripture, but from a liberal understanding of who God is. I’ve heard this versed referenced from the time that I was a child. Every evangelical Christian knows this verse and uses it as a trump card for how they are going to fix the problems in society. Since then, over 20 years have passed, and I have only seen a nation growing further from God, not being healed through repentance. So, either this promise is wrong, or most Christians don’t know what it actually means. “Is God On America’s Side?” is a refreshing response to the ignorance that is pervasive in Christiandom today. With a well balanced, biblical approach, Lutzer addresses this question from every direction and offers a straight forward response. Erwin Lutzer has been the pastor at Moody Church in Chicago for over thirty years and has written multiple books. His book, “When A Nation Forgets God” is particularly poignant at addressing the concerns of how the history of Natzi Germany is repeating itself in America today. His well balanced insight into history and theology provide a necessary balance for answering this tough question of where God’s allegiances lie. Lutzer takes seven principles to address this liberal notion about God that He only brings pleasant things into our lives. With several references to the attacks on 9/11, Lutzer points out that the air of spirituality that came out of this tragedy was not a deepening of biblical understanding, but a civil religion with a watered down version of theology which provided a common ground for people to rise up against terrorism. Secularists, as well as many Christians, saw the attacks on 9/11 as an affront on Christianity. Lutzer points out, however, that the Christianity that many people claim is under attack is actually closer to patriotism than the Bible. The book asserts rightly that God does not have a covenant with Israel, but because America was built on biblical principles, they have been blessed more than any other nation. With this blessing comes great responsibility, and America has failed to live up to it’s expectations. Lutzer points out many reasons for this, mainly that the Church has brought this upon themselves by blurring the lines between their great commission and their roles in society. Too often we, as Christians, are fighting for our own self interests that we loose sight of the fact that we are supposed to be meek and servant minded, concerned with the welfare of society. Under the guise of upholding the holy standards of God’s Word, many Christians are attempting to ward off the judgments they are facing instead of redeeming the culture which warrants that judgment. Their efforts to promote Christian values often make matters worse. The gospel is used as a stick to beat unbelievers into moral submission, rather than to reveal grace and mercy which leads them to repentance. Followers of Christ provide no hope and leave little impact on the world when they focus solely on the negative aspects of society. A great deal of the book confirmed many of my convictions about Christians and government. Lutzer does an excellent job addressing the Church for their failed responsibilities and the task they have before them. There were several moments when I was deeply moved and convicted by how I measure up to Scripture, and there were a few moments where I was left scratching my head, wondering where Lutzer’s opinions gained support. In the end, I was greatly impressed with his ability to be truthful and honest about the problems we face today, and I was encouraged that he provided a hopeful outlook for God’s people, even under persecution. I would greatly recommend this book to just about every Christian that I know. 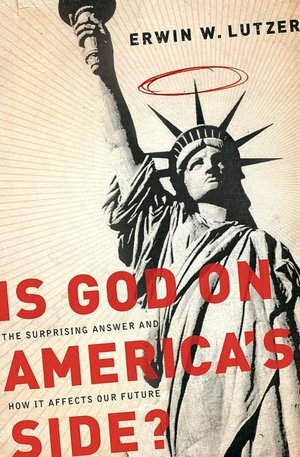 If I sat down with Lutzer and discussed some of my concerns with the book, I’m sure we would see things differently, but I feel that his biblical approach to the question, “Is God On America’s Side?” is well crafted and extremely pertinent today. If you are a grammar Nazi, you might want to get a newer edition of the book. I found at least 10 mistakes in my copy. Gallery | This entry was posted in Religion and tagged book review, Lutzer, Patriotism, Politics, Review. Bookmark the permalink. 1 Response to Is God On America’s Side? I really want to thank you for your review of, Politics – According to the bible on Amazon. I do not know your faith and politics but would love to see and hear your rebuttal essays on all the subjects as you have stated. If you do follow through could you please send to my email (sixtynine505@yahoo.com). This address is where I sort before moving further. I do see an issue about how you recommended this book or lack there of, as you can see like myself there is a good quantity of good reviews. Due to this I recommend this book to other with a piece of advise. There are many logical fallacies along with other issues.